There are some songs that just burrow into your brain the moment you hear them: something in them is just so vital, more often than not you'll find yourself buried under your sheets at five in the morning playing that one song on repeat. 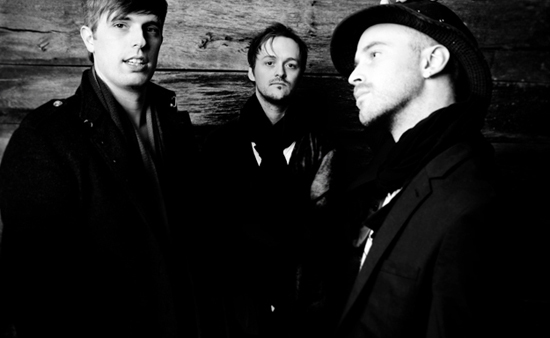 For a brief period of time between late September and early October, my song was "Calm My Soul," the closer of Paper Route's second album The Peace Of Wild Things. This song, however, was clearly built to last--it's January, and I keep going back to the song in the hopes that maybe this time everything will align, I'll finally be at peace, and I can finally move on to something else. But I'm not so lucky; I hit the repeat button. The music floods my ears. I'm not an inch closer to understanding. Something is just different about Paper Route. It plays the same strain of indie rock so many bands specialize in, wrapping gossamer wisps of synthesizer around murky guitar lines, yet instead of numbing my senses, the music warms them: the sincere emotional turmoil transcends the chilly atmosphere. "Are We All Forgotten," a track from the band's first release, demonstrates this principle ably. Its chorus is about as simple as music gets, but vocalist JT Daly's performance toes that hazy line between dejection and determination perfectly as the warm, dreamy production empowers him--even as all of his cries are buried under a flurry of guitar and drums wearing away at everything else in the song. The band's progress has only quickened with the release of The Peace of Wild Things: the deceptively poppy hooks, once-buried in the dense dreamscapes of predecessor Absence, took center stage, the instrumentation grew bolder and more intricate, and Daly stepped up his game as a frontman, delivering heartwrenching performances on everything from the bouncy, uplifting "Two Hearts" to the forlorn "Better Life" (its stripped-back chorus only made more affecting by its origin: it was discovered in a drowsy early-morning call when Daly sang it into his phone). For an album so concerned with big, sweeping moments, though, it finds just as much room for details: subversions of Biblical stories in "Glass Heart Hymn", metaphors between lovers lost in translation on "You and I", little swells of hopeful strings amongst the grief and anger of "Rabbit Holes." What does that all add up to? God help me if I know; I can only explain so much. Maybe that's the point: to me, dissecting everything Paper Route would have to offer would be like taking a hammer and smashing my best friend to bits so I could figure out what about that irascible mass of atoms I love so much. Now if you'll excuse me, I have to go bury myself under the sheets one more time and replay "Calm My Soul" again, but if you want to join, clicky-clicky on this link to Paper Route's website and fall down the rabbit hole with me.